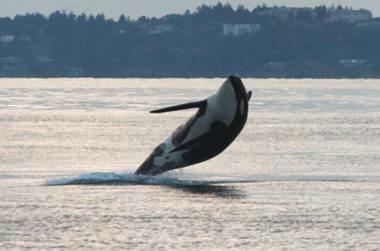 Ever since I was born in 1993, I have lived on an island in Washington State where a small population of orcas frolics along the west side in the summer time, looking for Chinook salmon to munch on. This island is called San Juan Island. We lived in a house with a view of the west side and growing up at this house was great. I had the big yard to run around in, a big pond with frogs and dragonflies galore and a forest surrounding the house that I was ready to explore. But I don't remember watching the orcas until I was 10 years old, even though they were literally in my back yard. The first time I ever saw an orca that I can remember was when I was 10. I was at a beach near my house when I scrambled up onto a high rock to look over the water. I do not remember if I had seen the orca surface and had climbed up the rock to get a better look at him or if I had just gotten lucky to see this spectacular sight while I was up there. Either way, a huge male surfaced not 20 feet away from me heading north. His dorsal fin was tall and straight while his saddle patch was closed and may or may not have had a finger. Every time I think back on this encounter I wish I could go back in time with the knowledge I have now and identify this male that I saw. Not getting to know all of the orcas that passed away before I became interested in them drives me crazy. At 10 though, this orca was cool to me but I left not feeling interested. The second time I watched the orcas was when I was 12 and I was with a friend at the same beach. A pod of orcas was heading south past us and one spy hopped to look at us while we sat on some rocks with the waves licking our toes from about 200 feet away. My friend and I ran away because we thought that the orca was hunting us and was going to come up onto the rock and grab us, like a population of Argentinean orcas that grab seal pups off of the beach by purposefully beaching themselves. Of course I would find out many years later that these were orcas that are only Chinook salmon. As I grew older I remember wanting to go out on a whale watching boat and see the orcas up close. In 2008 and 09 I remember asking my mom all the time we could go out whale watching. I am not sure what spiked the change to make me suddenly interested in watching the orcas, but my dream was about to come true. In July of 2010, my mom told me it was time for me to get a job so I asked a friend who was working on a whale watching boat if there were any openings. There were and after introducing myself to the boss/captain he invited me out on the boat to see if I would like the job. I was finally on a whale watching boat! We headed up Presidents Channel in between Waldron and Orcas Island. There we found J pod heading towards us. 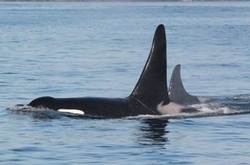 As we paralleled the J pod I saw someone who I will never forget. Ruffles J1, a 59 year old male, slowly surfaced in one fluid motion about 100 feet off of the boat. I will never forget that image of the tip of his 6 foot dorsal fin slowly ascending from the depths until his body followed. I got the job and Ruffles became the first orca I could identify in the Southern Resident population of orcas. After seeing him a few more times he passed away around November 2010. 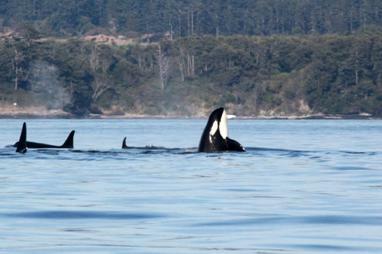 Over that winter I started learning how to identify the rest of J pod, as well as K and L pod members. I had caught the orca bug and there is no cure. Now as I write this in the year 2012 I look back and am amazed at how much my life has changed in such a short amount of time. I do not know where I would be now if it wasn't for Ruffles pulling me into his world. I now know how to identify every member of the Southern Resident orca population, except for a few calves if they are not next to their mothers, and am a certified marine naturalist telling guests aboard the whale watching boat all about the orcas that changed my life and how to help change theirs so that they will be around for generations to come.